Home Uptown Dallas Apartments | INSIDER Guide – Pt 3: What’s Available to Rent? Insider Guide – Part 3: What’s Available to Rent in Uptown Dallas? Uptown Dallas is a very special neighborhood in Dallas that will give you perhaps a once in a lifetime experience. It combines “walkability”, convenience, safety and sociability in one compact area like none other I have ever seen! That includes areas such as downtown Chicago, Silicon Valley and most other cities. Recently, Huffington Post gave Dallas the nod as the 5th most important city in the WORLD for young professionals. The most popular area of Dallas is absolutely Uptown Dallas. So, by moving forward with a choice to locate here, you will be locating into a unique and superb location. So, now that you have the location of Uptown Dallas selected, let’s focus on explaining a bit more about the Uptown Dallas area. It has actually 5 pockets or mini-neighborhoods that each have a different feel and lifestyle. These areas include McKinney Avenue Dallas area in the south, West Village, Turtle Creek, Inner Uptown and Uptown Crescent. McKinney Avenue in the South: McKinney Avenue is the main thoroughfare that runs throughout Uptown Dallas. Many Night Spots of Uptown Dallas are located throughout McKinney Avenue especially along the south portion. West Village Dallas: The most concentrated focus of things to do in quick walking distance is absolutely the West Village Uptown Dallas area. Crescent area of Uptown Dallas: This is the area closest to Downtown Dallas. It gives you the quickest access to work in Downtown Dallas. To sum it up, your focus should be finding the best fit for your lifestyle…then go and choose your residence within that area. Uptown Dallas Apartments – The most popular option for leasing in Uptown Dallas. The options for leasing in Uptown Dallas is overwhelmingly apartments…hands down. Other cities have more options because they are either older or had a more eclectic architecture makeup (Chicago for example). For Uptown Dallas, your most convenient option is definitely apartments. They have been strategically placed to allow you to capture the best of Uptown Dallas. Traditional garden style apartments – think old school apartments with 2 or 3 floors. Since these are typically older, they have the least security and the least amenities typically. Mid Rise Apartments – these are typically 5 to 10 stories. The mid-rise is the most popular option when consider apartments in Uptown Dallas . Mid rises typically offer private floors with elevators to access, along with in the building parking. They are better for security. 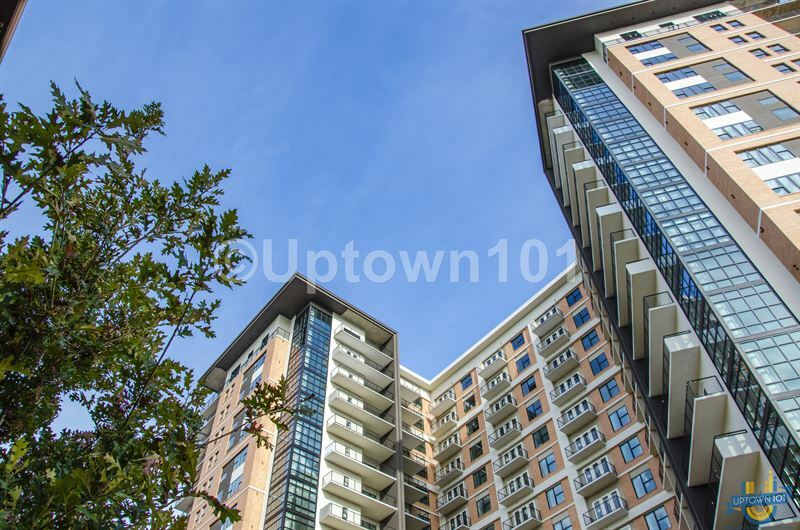 High Rise Apartments (10 stories and above) – Definitely the minority, but there are some excellent high rise apartments in Uptown Dallas. The high rise lifestyle also tends to have an accompanying higher level of service associated with it that professionals find to be convenient and money saving. For example, an onsite concierge available at high rises can take care of many things while a professional is at work or out of town at no or minimal charge. LOOKING IN ADVANCE GETS YOU THE BEST DEAL – All of these Uptown Dallas apartments typically will have ample availability if you look IN ADVANCE. By advance, I mean 60 to 90 days or more in advance. You typically will get much better deals that way, because more is available and pricing tends to be lower as well. Make sure to sign up for our free Daily Apartment Alerts service to take advantage of that. DOORMAN NOT AVAILABLE but WE HAVE CONCIERGE! : Our wonderful NYC clients love a good doorman. In Uptown Dallas, we don’t have paid doorman staff. One of the reasons is that the Uptown Dallas area in general is because we have good safety overall, this concept never caught on here! But, we DO have Concierge Staff here, primarily in High Rise apartments. If you want to know some of the best High Rise apartments in Uptown Dallas with a concierge, simply request it and we will get right back to you with the BEST! I hope you have enjoyed this quick discussion of types of housing here for Uptown Dallas apartments. To get more detailed information, simply send in a contact request or jump on one of our CHATS. We will be available quickly to help your needs. Uptown Dallas Apartments | Insider Guide Pt 2: Live NEAR Uptown?VOTE for the Best Uptown Dallas Apartments Pool!